So, you have made the decision to lose some weight, work on your strength and stamina or overall fitness, but you don’t have time to go to the gym. Forget about the gym and find the best elliptical trainer that you can use at home for a full body, cardio, or weight loss workout. Elliptical trainers have a lower impact on your joints than normal running or walking so they are suitable for young and old. They are so much more convenient than the gym and will save you time and money. 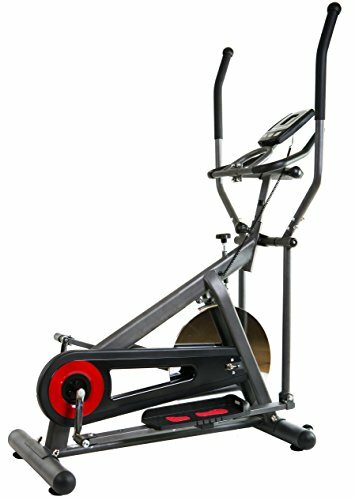 How to properly use an elliptical? How to fix elliptical resistance? 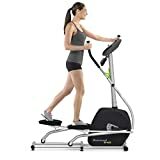 How to adjust stride length on elliptical? 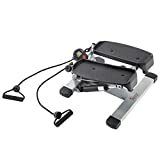 This is a compact and quiet, magnetic resistance elliptical trainer from Efitment – a portable, lightweight elliptical trainer that gives you a full body workout. It has less impact on your knees while giving you all the benefits of running. The Efitment E005 offers 8 levels of magnetic resistance to easily adapt to your training requirements. The Efitment E005 has many great features to offer. It has 8 magnetic resistance levels which you can easily adjust to the required level depending on the type of training you are doing. The LCD screen displays speed, time, calories burned, distance, pulse rate and scan. Batteries power the LCD monitor, so you don’t need an electrical outlet to operate the trainer. The handlebars are perfectly centered to give you optimal balance while the large, non-slip, textured foot platforms easily accommodate all users. The hand pulse sensors that are conveniently built into the stationary bars. Perfect for monitoring heart rate while doing a cardio workout. The E005 operates using a belt driven flywheel. The advantages of this are that you have a smooth, quiet, and maintenance-free workout. It also has transportation wheels incorporated so you can quickly and easily move it around the room and for easy storage. As an added advantage, the end caps on the legs double up as stabilizers to prevent rocking, swaying, or tipping. The end caps can be turned until you get the required position and stability. No matter what surface you are on, hardwood floors or carpets, simply turn end caps until the elliptical is level. What I really like about the EFITMENT E005 belt drive magnetic elliptical trainer is the size. It is so compact and easy to use; you can move it around your home with ease. No matter how small your exercise space is, with this elliptical trainer you can make it work. Best of all, when your workout is done, simply move it on the transportation wheels and easily store it out of sight. The downside of the EFITMENT E005 elliptical trainer is that been compact it has a small stride distance making it more suited for women and shorter people, than men with a larger stride. The foot platforms have been made large to accommodate all sizes up to 220 lbs. ; however, the small stride distance is uncomfortable for taller people. LCD screen shows, speed, distance, calories burned, time, pulse rate and scan mode. This unique desk elliptical by Cubii is possibly the best sitting elliptical trainer available. It has been designed for people who are always on the go and don’t have time to stop for a workout. It is whisper quiet and discreet to easily fit under your desk or in front of the couch. Exercise while you are working at your desk or watching TV – no need to set time aside for your workout. The Cubii Jr. is durable and sturdy and was built to last. A lot of time and thought has gone into the construction of this desk elliptical to give you a product that is safe to use and will last a lifetime. This desk elliptical trainer is very discreet and quiet, so you will have no problem exercising while sitting at your desk, in the office or while watching TV. You can use it anywhere you like, and it is small enough to take with you. The ergonomic angles have been designed for absolute comfort during the workout. No need to worry about bumping your knees on your desk and it gives you an exercise that has a low impact on your joints. The Cubii Jr. has a built-in display monitor that tracks calories, real-time, RPM, distance, and strides. Easily adjust and control the level of resistance with a choice of 8 levels. Assembly is quick and easy with only 4 screws and an estimated assembly time of 3-5 minutes. It also includes 2 wheel stoppers that you can put on your office chair, so it doesn’t roll around while you are exercising. Patented ergonomic angels provide a smooth elliptical exercise that is low impact on your joints. Select from 8 resistance levels, allowing you to adjust and control the intensity of your workout. Your purchase includes all required equipment for easy assembly (4 screws and you're done). Estimated assembly time is 3-5 minutes. What really has me excited about the Cubii Jr. desk elliptical is the convenience of it. This is a well-thought-out, well-designed desk elliptical trainer that will save you time and doesn’t take up much space. It is discreet, compact, and still offers an effective workout. The Cubii Jr. is only made to use while seated. I would have preferred the option of being able using it either seated or standing. It also doesn’t have Bluetooth or any fancy technology to interact with other devices or back up your workouts. The Schwinn brand has done it again and is showing why it is a leader in the market when it comes to elliptical trainers. The 470 Elliptical trainer is one of the best in its class and offers you everything you could possibly want in an elliptical trainer. Feature packed, sturdy with loads of extras. The Schwinn 470 has a complex console that will keep you informed at all times. With a DualTrack, two blue backlit-LCD window system that allows you to monitor up to 13 different display feedbacks at once, it offers 29 preset exercise programs, 12 profiles, 8 x heart rate control, 4 x custom user-defined and 2 fitness tests, and much more. The console also has a USB charging port, so you never have to worry about phones, tablets or music players running out of battery life. It also has Bluetooth connectivity which allows you to connect to other devices. You can transfer your workout information to the free Schwinn trainer app or connect on RUN SOCIAL to accept challenges, set up group runs all live with others around the world. It also boasts an adjustable 3-speed fan, speakers, and a center-mounted water bottle holder and transport wheels. You have a choice of 25 different computer-operated levels of resistance, so it is suitable for everyone from beginner to pro. It has a maximum weight capacity of 300 lbs., which is phenomenal. It offers a good stride distance of 20’’ while the precision path foot motion technology stimulates a natural running motion. The adjustable ramp is motorized and allows for in-workout incline changes for challenging workouts. The large foot plates are cushioned for maximum comfort and low impact. The sturdy frame and high-speed, high-inertia weighted flywheel gives you a smooth and silent workout. 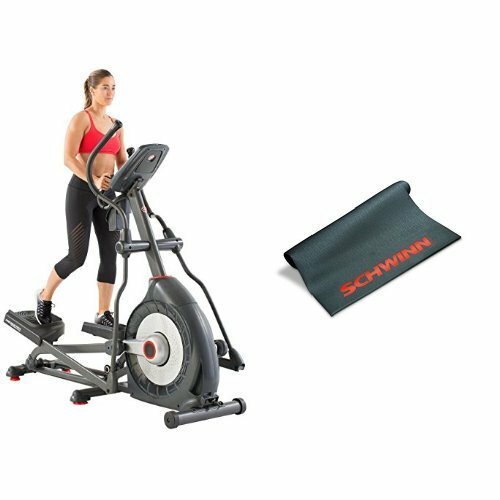 The Schwinn 470 elliptical trainer has so many features that I like that it has been difficult to choose one feature; forced to choose I would say the technology that it offers with Bluetooth, the USB charging port, speakers, and fan. All these features combined will keep you entertained while enjoying your workout, which will make you want to exercise more often and have longer sessions. While the console is great, and it offers you numerous programs and loads of other great functions, with a fancy console like this, there is a larger possibility of it becoming faulty. It is something that I want to have, but then I start worrying about the amount of maintenance it may require. Wireless heart rate monitor not compatible with Polar Strap. Designed for home use, the BFX8000 by Body power features a steel frame with 4-way adjustable handlebars. It has a solid, heavyweight flywheel for consistent momentum and an ultra-smooth workout. Giving you a total body workout, this is one of the best elliptical trainers that you can use at home for strength, stamina, or weight loss. The console on the Body Power Elliptical trainer is very basic and displays calories burned, time, distance, and speed; it also has a scan mode for you to run through the modes. Being basic, it stores no personal information and it does not have connectivity such as Bluetooth for you to connect to other devices. The advantage of the basic meter is that the digits are extra-large and easy to read. It is battery operated so no electrical outlet is required to operate the elliptical trainer, and it is super easy to operate with only three buttons. The frame is made of durable and sturdy steel, so this machine is in no way flimsy and it is built to last. The adjustable handlebars are an added advantage making it easily adjustable for different types of exercises or for different people. The foot ends on the base of the frame are adjustable allowing you to stabilize your elliptical trainer, no matter what your floor surface. Combined with a balanced flywheel, you have a silent, consistent, and smooth workout. The friction-resistance tension is easily adjusted with the turn of a knob, which is conveniently placed and easy to reach. It has a weight capacity of 250lbs and comes with a manufacturer’s warranty. What attracts me most of the Body Power Elliptical trainer is the simplicity of it. It is extremely well built, strong and sturdy with a very basic meter. It can give you all the basic information you would want during your workout, while keeping it simple. With an elliptical trainer for home use, you don’t need all the bells and whistles that you would never use in any case. The price is about the only thing I don’t like on this Body Power BFX8000 elliptical trainer. While it is strong and sturdy and a great Elliptical cross trainer, it does seem a bit pricey when compared to other models in its class. The basic-looking Universal E40 elliptical trainer from brand Nautilus is feature packed and a great option for a home trainer. At first glance you will see what looks to be a very basic, entry-level elliptical trainer; however, on further inspection, you will be pleasantly surprised by this trainer that offers you much the same as some of the other bigger brands but at a fraction of the price. The console has a monitor that tracks heart rate, time, RPM, speed, distance, and resistance level. The console is very basic and is battery operated, so it can be operated anywhere and does not need an electrical outlet; however, an AC adaptor can be purchased separately should you prefer to use an electrical outlet to save on batteries. There are 7 preset programs on the Universal E40 console; you can choose between the quick start or a preset program. It has 8 magnetic resistance levels for you to adjust the intensity of your workout. The Universal E40 has dual built-in speakers below the console where you can plug in your iPad or MP3 player, so you can listen to music during your workout. The speakers have no volume control, so the volume will be controlled by your device. Universal E40 elliptical trainer offers you the option of static and moving handgrips, which gives you options for different workouts. The moving handlebars have two grip-positions, while the static handlebars have built-in pulse sensors. The E40 elliptical machines large size non-slip foot pedals have a security guard all around the pedal to keep you stabilized and prevent slipping during the workout. The flywheel is a weighted 13.2 lbs., which gives you a smooth, consistent motion. The trainer has a belt drive making it quiet to operate and will have less maintenance. The universal E40 elliptical trainer from Nautilus offers you everything you need in a home trainer. What Nautilus has got right with this trainer is that they can offer the novice or home user a top-quality elliptical trainer at an affordable price. It is also compact and lightweight, so you don’t need a lot of space to exercise and it is easy to store away out of sight. Good for Nautilus for adding a feature such as speakers to such a basic model; however, if you are going to do something like that, you need to do it properly for it to add value to the machine. The speakers are average to low quality and have no sound control; you need to control the sound through your device. A better-quality speaker would make a world of difference. Exercising has never been easier, especially when you have access to a machine that can easily be placed under your desk such as the SereneLife Fitness Exercise Machine. Designed with the everyday person in mind, you can burn calories and fat without having to stand upright on a traditional elliptical, yet you can still experience the same benefits. Digital LCD Display. It’s quite important to keep your eyes on the metrics you produce with every workout to know exactly how many calories you’re burning. The SereneLife Fitness Exercise Machine displays time, speed, as well as burned calories, giving you access to all of the important information you need for peak performance. Under the Desk Versatile Design. Instead of relying on a traditional elliptical, this unit offers an under the desk versatile design that allows you to go through a full body workout without having to visit a gym. It is also designed to accommodate a variety of different sized feet, different body types, and body sizes. Durable Construction. Built to last, this stepping machine is ideal for people who intend on using it on a regular basis. With a strong reinforced steel body and battery operated LCD display system, it offers a weight capacity of 220 pounds. Great for standing desks. If you’re the type of person that prefers to stay active throughout the day with a standing desk, it’s easy to see why this particular fitness machine will fit perfectly into your daily regime. All you need to do is place it under your desk and you can begin stepping and burning calories within minutes. Feels sturdy and reliable. If there’s one thing you’ll certainly notice about the SereneLife Fitness Exercise Machine it’s that it feels sturdy and reliable. These are two things that are important for a workout machine that you’re going to use on a regular basis. Non-adjustable tension. If you like to have a custom touch to your workouts, you might be better served finding another elliptical machine that allows you to adjust its tension. Unfortunately, this under the desk workout machine doesn’t offer any adjustable features. Slow workout. Another issue with the SereneLife Fitness Exercise Machine is that it works incredibly slow, meaning that you’re not going to be able to burn as many calories as you would with a traditional elliptical. Having your own standing elliptical can be a great benefit, especially if you’ve always been wanting to tone your body and achieve your ideal physique. With the EFitment Magnetic Elliptical Machine, losing weight and toning has never been easier, especially as it offers a simplistic design that is easy for anyone to use. Full Body Workout. The first, and most important feature of the EFitment Magnetic Elliptical Machine, is that it offers a full body workout instead of focusing on your legs alone. With every stride on the machine, you’ll feel the burn in both your upper and lower body as it is designed to mimic the same posture as running. Quiet Operation. Instead of relying on a loud machine such as a treadmill, the EFitment Magnetic Elliptical Machine is quite quiet, making it easy to work out at odd hours of the day and night. The flywheel is driven by a belt, which helps to improve its stability and smooth feel, meanwhile offering nearly silent operation. Digital Monitor and Metric Tracking. The digital monitor integrated into the EFitment Magnetic Elliptical Machine is another notable feature to know about as it tracks your burned calories, time, distance, speed, and your pulse. Great for small spaces. In apartments and smaller homes, finding space for a larger elliptical can be a task. Luckily, the EFitment Magnetic Elliptical Machine is approximately four feet long when installed, making it ideal for smaller spaces. Very quiet operation. 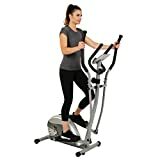 There’s no need to worry about disturbing other people in your home or residents around your apartment with a loud workout machine as this elliptical is specifically designed to be quiet and it is quite stealthy when used properly. Short strides. If you’re in the market for an elliptical that is recommended for taller people or people who prefer longer strides, this is not the machine for you. Unfortunately, the EFitment Magnetic Elliptical Machine only offers short strides which can be great for a strong cardio workout but difficult to get used to at first. Feet may slip forward. 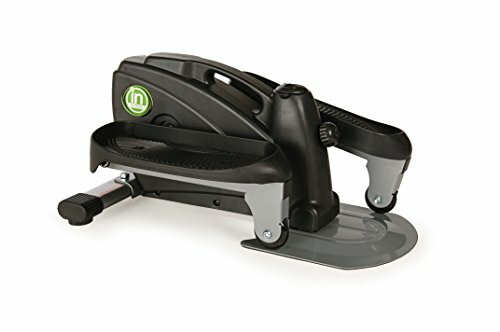 Another issue with this elliptical is that it does not offer a strap or front lip on the foothold, which may mean that your feet might slip forward while using the machine. If you’re tired of relying on traditional workout equipment, it might be time to liven things up and choose a machine that you’ve likely never used before. 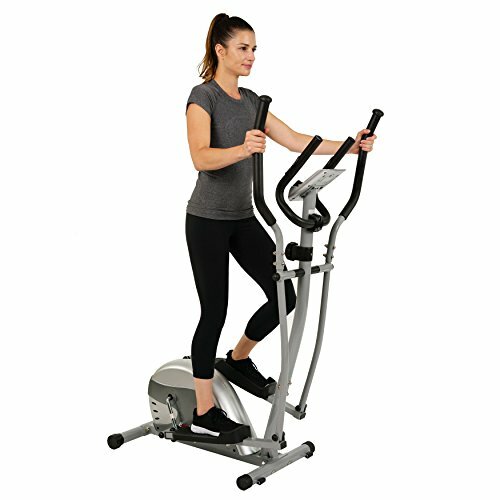 The Brenda DyGraf Fit Rider x Elliptical is a unique workout tool that gives you the same benefits as a traditional elliptical but in a much more comfortable fashion. Smooth and Silent. There’s no need to worry about a machine that makes a ton of noise when you start it up, especially if you’re someone who prefers to work out at night. Luckily, this crossover between a rider and elliptical is entirely silent and quite smooth when you use it. Included Training DVD. As the Brenda DyGraf Fit Rider x Elliptical was developed by fitness trainer Brenda DyGraf, you’ll also receive a personal training DVD that you can use to learn some great workouts to use with the machine. Comfortable Features. To help keep your body comfortable while you’re working out, this particular elliptical is equipped with anti-slip pedals, a large seat that also includes comfort padding, and padded handlebars. Useful for all muscle groups. One thing you’ll certainly realize once you start using the Brenda DyGraf Fit Rider x Elliptical is that it works all of your muscle groups instead of focusing solely on your legs. You’ll feel the burn in your abdomen, shoulders, and back. Strong and sturdy design. 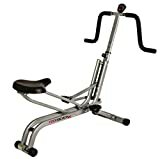 Designed to support up to 220 pounds, you’ll truly feel how durable this machine is once you sit on it for the first time and use it over the years. You won’t have to worry about squeaking or loose screws the more you use it. Easy to assemble. 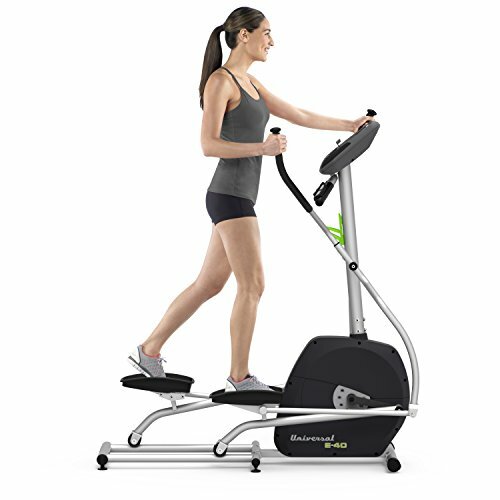 As one of the largest difficulties of workout machines, the Brenda DyGraf Fit Rider x Elliptical doesn’t come with a multitude of different screws and bolts to put the entire unit together, making it quite easy to assemble. Tough on your back. The Brenda DyGraf Fit Rider x Elliptical encourages your body to be in a rowing position for the duration of your workout and it can be slightly uncomfortable to use until you begin to build muscles in your back. Not recommended for tall people. Ideally, this machine is great for people at six feet and shorter; if you’re a taller person you’re far better off opting for a traditional standing elliptical. For people who have always wanted to work out but have constantly been on the hunt for a low impact exercise machine, the Sunny Health & Fitness Twister Stepper is a great option to consider. It offers a twist action design that helps to target your buttocks and thighs, and in order to help you build stamina, it also offers a comprehensive cardio workout. Low Impact Exercise. The majority of exercise machines can put a lot of stress on your joints, but luckily the Sunny Health & Fitness Twister Stepper is designed for low impact exercise which helps you to burn fat without joint discomfort and pain. Exercise Arm Bands. With the integrated armbands, you’re also able to focus on working out your upper body instead of dealing primarily with your lower body. Also, the armbands help you to create a more diverse workout to keep you interested in losing weight. Onboard Computer. Keeping track of your metrics is quite important, especially when you’re trying to reach a goal with your workouts. The onboard computer measures time, burned calories, your total step count, and your rep count. Easily adjustable tension. It’s always best to have complete control over your workouts in order to get the most out of your time. With the ability to adjust the tension of the steps, you’ll be able to customize how much fat you want to burn during your workout, helping you to achieve your goals much faster. Adjustable arm straps. Another great adjustable feature is the arm straps that come equipped with the model, allowing you to accommodate shorter and taller frames based on who is using the stepper. Automatic computer power feature. Instead of having to worry about bending over to turn the onboard computer on or off, the unit powers itself up or down automatically, giving you the ability to literally get onto the stepper and start working out immediately. Short and constant steps. If you’re searching for a stepper that will give you the ability to take longer strides, this is not the unit for you. You’re going to need to keep your pace at a high level for the duration of your workout in order to get used to the short and constant steps. May require internal oiling. After approximately six months of use, the Sunny Health & Fitness Twister Stepper is prone to some squeaking and squealing, especially if you use it every day. Depending on your personal preference, you may or may not want to deal with a unit that you’ll have to sufficiently lubricate every couple of months. By owning your very own exercise stepper that you can keep absolutely anywhere in your home, there’s no need to visit the gym if you’re looking to burn calories quickly and privately. With the help of the Flexispot Home Exercise Stepper, you’ll be able to target both your upper and lower body at the same time, promoting phenomenal weight loss much quicker than you originally expected. Heavy Duty Design. Built with heavy-duty steel and reliable screws and bolts, the Flexispot Home Exercise Stepper is built to last throughout the years. Another interesting highlight pertaining to its design is its anti-slip footplates which are designed to keep your feet in one place for the duration of your workout. Versatile Workout Options. 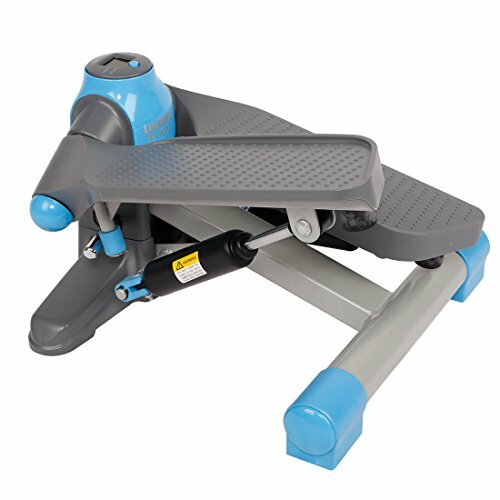 Another feature of the Flexispot Home Exercise Stepper that is interesting is its versatility. Due to its small and compact size, you can use it under a desk, place it in the corner of your room, or even use it at the end of your bed. In comparison to traditional workout machines, it’s far more convenient and easy to use in smaller areas. Boosts workout convenience. If there’s one thing that can be said about the Flexispot Home Exercise Stepper is that it helps to boost workout convenience as it enables you to burn calories absolutely anywhere in your home. It’s lightweight, compact, and easy to put in front of your TV or even at the side of your bed, encouraging you to burn calories more often throughout the day. Works well with standing desks. Unlike other steppers that might be a little too difficult to use under a desk, the Flexispot Home Exercise Stepper is incredibly useful in an office space. There’s no reason as to why you can’t try burning calories throughout the day when you’re tired of sitting at your desk. Strong resistance. The resistance in the Flexispot Home Exercise Stepper isn’t too tough to where you’ll only be able to work out for five minutes a time, but it is strong enough to help you burn more fat in comparison to most other steppers. Consistent squealing and squeaking. 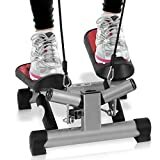 For people who have used steppers before but have dealt with squeaking and squealing, this is certainly a model that isn’t recommended for a stealthy workout. There are internal components that may begin squealing within your first couple of uses which can be quite distracting, especially if you’re using it in an office environment or while watching TV. Requires constant oiling. In order to prevent the constant squealing and squeaking, you’re going to need to regularly lubricate the pistons and gears within the Flexispot Home Exercise Stepper which can be a time-consuming task. Compact workout equipment is becoming more and more popular, especially as people are looking for better ways to incorporate working out during the day. The Stamina InMotion Compact Strider is a durable and sturdy machine that you can use in a variety of areas ranging from your home to your office and it has some interesting advantages and product highlights to think about. Adjustable Tension. Everyone is different when it comes to using a stepper, especially in terms of tension as some people prefer more whereas others prefer less. The Stamina InMotion Compact Strider allows the user to adjust the tension based on their personal preferences, which can also be a great way to keep track of your progress. Built-in Fitness Monitor. The built-in fitness monitor is designed to keep track of your distance time, strides, and burned calories, giving you the utmost amount of metrics that you’ll need to notice a significant improvement in your physical health. Non-Slip Pedals. Designed with the comfort of every user in mind, the Stamina InMotion Compact Strider offers non-slip pedals that help to keep your feet in place the entire time you’re using the machine. Easy to go fast or slow. Although the stride size of the Stamina InMotion Compact Strider is relatively small because of how compact it is, you have complete control over how quickly you want to move on the machine. With the help of the adjustable tension, you’ll find that it’s quite simple to choose to go fast or slow with your workouts, based on your stamina. High-intensity training. If there’s one thing that can certainly be said about the Stamina InMotion Compact Strider it’s that it offers high-intensity training, which is phenomenal for people who want to build on their overall strength and stamina. Compact and easy to move. With its convenient and compact design, this stepper can be used absolutely anywhere, which is perfect for people who don’t feel like going to the gym when they can work out at home. It is also quite lightweight which helps to make it easy to bring with you relatively anywhere you’d feel comfortable enough to exercise. Users need to wear shoes. If you were hoping that this was finally a stepper that would be comfortable enough on your feet to where you wouldn’t need to wear shoes, you’d be better off with another machine. The anti-slip ridges and grooves are incredibly uncomfortable on bare feet. Will start squeaking. As with most steppers, the more you use it the more likely it is to begin squeaking without proper maintenance. The best suggestion is to find a bike lubricant and make sure that all of the cylinders and pistons are sufficiently lubricated before the squealing begins. You will find elliptical trainers, elliptical cross trainers, elliptical desk trainers, and elliptical gliders. Each has features that make them different from the others. Gliders move up and down at an angle to give you a hip, knee, and leg workout. 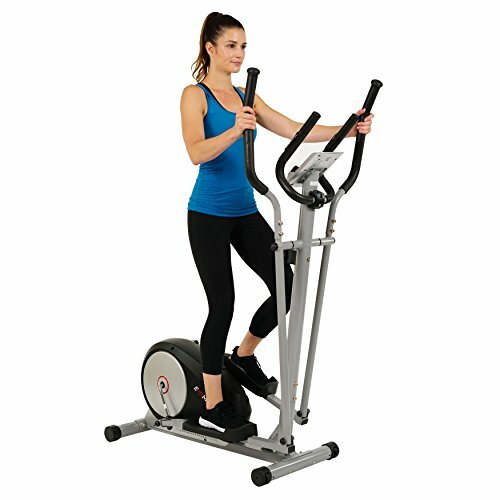 A cross trainer has moving handlebars and is aimed more at a cardio workout, while an elliptical trainer has fixed handle bars for more of a lower body workout. We don’t all have ample space available in our homes for big bulky machines. If you have limited space, a more compact model will be more effective. A bonus would be if it has transport wheels for you to easily move it out the way for storage. Resistance affects how much force is needed on the foot platforms to complete the pedal stroke. The resistance level is what controls the intensity of your workout. Different elliptical trainers have different weight capacities and are normally between 200 and 300lbs. It is very important that the elliptical trainer you choose is compatible with your weight. Basic features that most elliptical trainers have is a monitor that allows you to monitor your heart rate, distance, speed, and strides. The more expensive models will offer pre-set and custom programs, custom courses, and connectivity to other devices and apps via Bluetooth. As when making any purchase, it is important to know what warranty or guarantee you have on the product. Most elliptical trainers have a one-year manufacturer’s warranty and some brands may offer more. Get on the elliptical, by grasping the handlebars and then putting your feet on the pedals. Align your feet parallel with the edges of the pedals. Always keep your back straight, keep your head up and facing forward throughout the workout. Position your arms on the handlebars and start to pedal forward with knees bent slightly, set your level of resistance, and keep going for approximately 20-30 minutes. If your elliptical’s resistance stops working, consult the troubleshooting guide in your manual. If you don’t find the fix, then it is best to contact the manufacturer, especially when the machine is still under warranty as tampering with the machine may void your warranty. The type of elliptical you need will depend entirely on what you want to gain from using it. Elliptical gliders move up and down at an angle to give you a hip, knee, and leg workout. 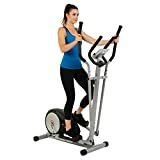 Elliptical cross trainer has moving handlebars and is aimed more at a cardio workout, while an elliptical trainer has fixed handle bars for more of a lower body workout. Elliptical trainers offer a much lower impact workout than treadmills. The running or walking motion that you will do on a treadmill has more or less the same impact on the joints than normal running, while the same exercise on an elliptical trainer has a much lower impact on your joints, making it safer and more comfortable than a treadmill. Most elliptical trainers do not have an adjustable stride length, so you need to purchase a model that meets your stride length requirements. The models that are adjustable have a stride adjusting knob that you can turn to adjust it to the desired stride length. 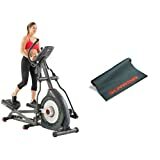 In the search for the best elliptical trainer, my conclusion is, while the Schwinn 470 Elliptical Machine may not be the cheapest of the lot, it offers you all the bells and whistles and extra features that some may find important. The fact that it has Bluetooth connectivity to connect to other devices and apps means you will be kept entertained and more inclined to exercise longer. It also offers extra features such as fans, speakers and USB charger which are fantastic. If you are on a budget with limited space, then you may want to take the Cubii Jr desk elliptical home with you. It is small, compact, discreet enough to use at home or at the office with a monitor that gives you everything you need.